And just like that, we’re planning Oyster Fest again. Shore and I sat down with this year’s committee two weeks ago which means the process is underway –we’ve got just over 5 months to pull the 3,000 person beach party together. I’m not losing sleep over it yet. But talk to me in August. Thankfully, we’re using a similar set up to last year (tent size, footprint, general schedule and set up) with a few new tweaks (new headlining band, updated list of chefs, a little more control). But right now, I’m thinking about the pigs. 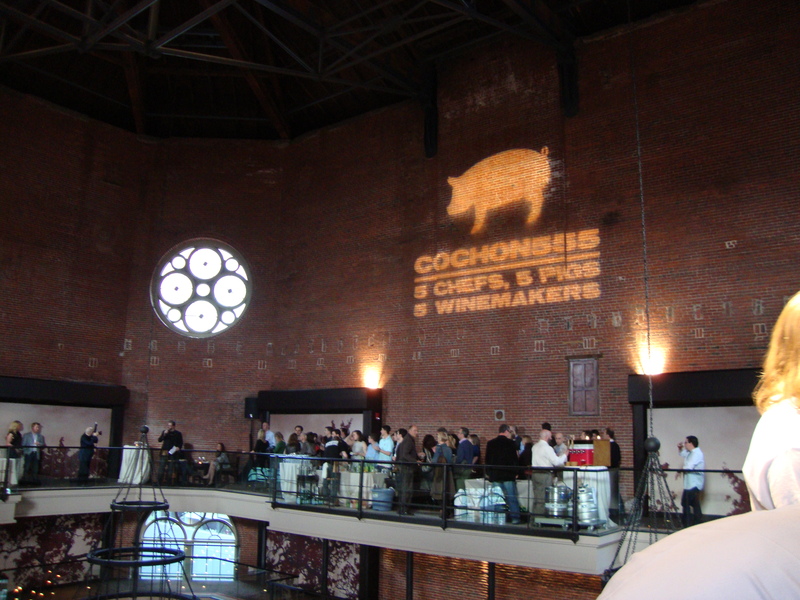 Last night, CJ and I shucked oysters for the VIP room at Cochon 555 (I went to as a guest last year). We had the good fortune of meeting a potential pig farmer as well as a number of cool Johnson & Wales culinary students who very kindly donated their time. 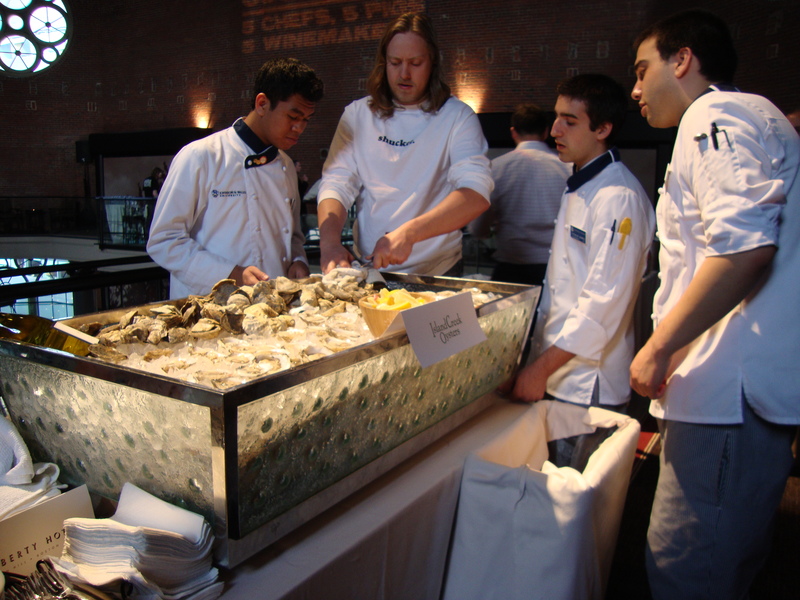 CJ repaid them by giving them a valuable shucking demo – we even put a few behind the raw bar. It was good to get back there and shuck for a crowd again. Sometimes I get weighed down by all that we have going on but once you’re standing back there, it’s nothing but you and your crew, shucking as quick as you can (and looking up now and then to see some smiling faces). We’ve got loads of raw bars coming up: Save the Harbor this Wednesday, CentralBottle’s $1 Oyster Night this Thursday, the Nantucket Wine Fest in May. My job is to coordinate the logistics of all of our events. Well, at least that’s one of them. 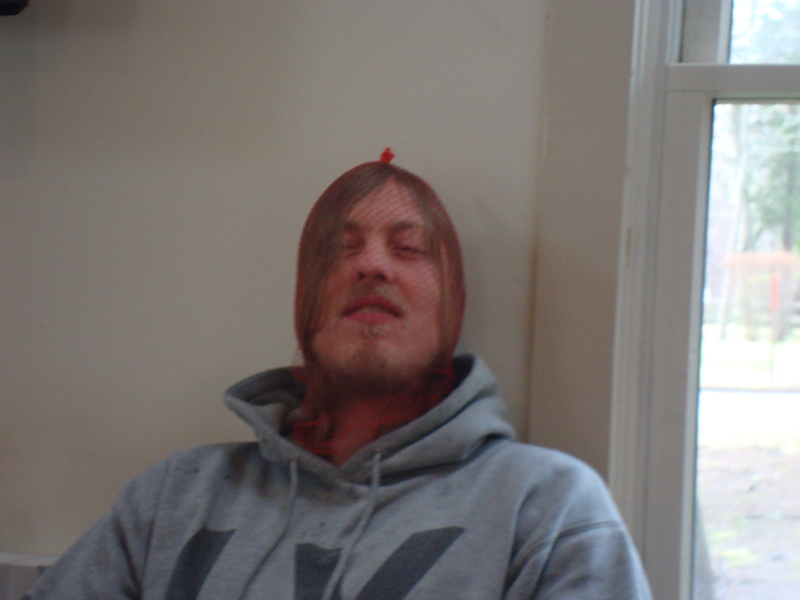 I seem to be wearing all kinds of hats these days. As I shape and reshape this experience, my role is constantly shifting. My time in the office has been eye-opening. Being so closely connected to the nerve center of this tiny machine and directly involved in big discussions, I’ve gotten full exposure to every part of Island Creek. We’re having in-depth conversations about who we are, where we’re going and how we stick to our core. This winter, Shore and Skip have been crafting Island Creek’s purpose and core values. We’ve initiated a rebranding campaign (hiring the very cool and talented Oat Creative, who are a pleasure to work with) and we’re pulling together a structured sales and marketing program. Though the company, Island Creek Inc. has been operating for a few years, they’ve been so busy getting the job done that they haven’t had time to do things like put a mission statement on paper or take a closer look at their logo (the first one was scribbled on a napkin). This year, I’ve been lucky enough to catch them while they slow down, take a breath and figure out where to go next. Of course, everyone pitches in wherever they can. So in between setting up events, I’m visiting restaurants for sales, ordering new tshirts and raw bars, doing quality control in the shop, and yes, sometimes taking out the trash. But so is everyone else in the office (even CJ who provides levity when he’s not making deliveries). But that’s what makes it fun. It might be a small business but there’s a lot of heart and soul. And plenty of work to be done. « One year and counting.